Ex GO 2281 with new plate 7384BJ was parked at a lot of a church near Warden and Steeles. It is also easier for people to walk in subway station without tapping card by activating sensors from inside or outside and the gate open, then infinite number of people (the most I have seen so far was 8 students) can walk through the gate. This simply is the management in the approval of the this kind of design of fare gate. And now the honest riders are paying the price of the mismanagement. Last Friday 3 ladies walked into Finch station bus platform, a special constable who was sitting in his car watching his phone at the moment saw them but did nothing. This afternoon WB 1652 (199B) had a full load of passengers and was running normally until another empty bus 1756 (199A) was fast approaching from behind, so 1652 (Express bus) made a stop north of Huntingwood to let 1756 to pass by first, apparently this upset the driver of 1756 as he had to pickup the load of passengers at McCowan & Finch, so he didn't move at that stop and when 1652 stopped in behind, the driver of 1756 gave a lecture to the driver of 1652 and that resulted a 5-minute delay. Un-rebuilt 8322 was in service yesterday afternoon. In addition to the above, 3009, 3012 and 3014 don't have functioning A/C, As the weather is getting cooler, I think the problem can be deferred to the next summer season. 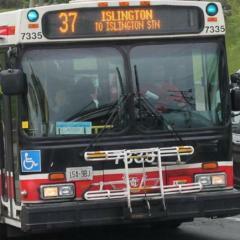 The same 1523 broke down at Finch station this evening. 1751 broke down and was abandoned on July 14. Did anyone notice some middle SRT cars (3019, 3021 etc) don't have the AC turned on this year? All the lead cars are fine. 2744 was the first one in July 2000. Yes, and how to do the same in a Word document?